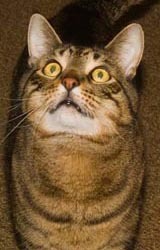 First it was Hurricane Sandy, then it was the Frankenstorm and now it’s Superstorm Sandy. For many people in New York, New Jersey and in particular it was - and indeed still is - unimaginably horrific. Here in north east Pennsylvania we got off lightly; we were without electricity, heat, water and internet for almost exactly four days until yesterday afternoon and with highly unpredictable phone service for most of that time. A 50ft maple fell across our driveway, taller hemlocks fell nearby on one side, even taller oaks and maples on the other. One went right through our neighbor’s shed; but our houses were spared. Strangely, in spite of those ferocious winds, there are still golden leaves on our Asian witch hazel and bright yellow leaves on our Hydrangea arborescens ‘White Dome’. I’m not going to show you pictures of our fallen trees – it’s nothing compared to what some people have suffered. On The Guardian’s website you can see pictures of the storm damage and pictures of the aftermath. Local radio service was knocked out by the storm, so we only had radio service from New York 80 miles away, which was the opposite of what Brits would expect: public radio news was embarrassingly bad, commercial radio was good. But all was New York news. For four days there was no way to get any local information at all. So… We piled logs on the open fire, cooked food from our steadily thawing freezer on the grill, fried eggs out there too – and read by daylight, flashlight and candlelight. So I was able to actually read Dirr’s Encyclopedia of Trees & Shrubs by Michael Dirr, all 950 pages of it, rather than look things up in it. OK, I didn’t read every single page but I read quite a lot of it. A proper review will come in a week or two but being an easy read, and opinionated and packed with information and very well illustrated is a winning combination for American gardeners. 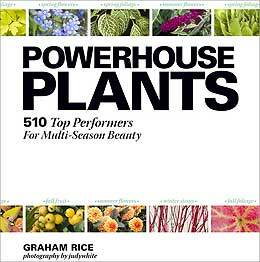 I wonder how it compares with the new Timber Press Encyclopedia of Flowering Shrubs by Jim Gardiner, a British expert. When Jim Gardiner’s book arrives, I’ll be able to tell you. 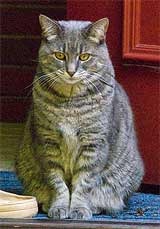 I’ll try to sit down and read that too – without the need for another storm. 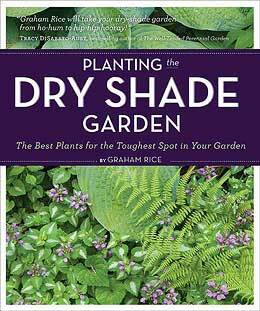 Some news about my new book, Planting the Dry Shade Garden.... This month, in The American Gardener, you can read my six page feature entitled Planting in Dry Shade (above, click to enlarge). The American Gardener is the members’ magazine for The American Horticultural Society. This splendid bi-monthly magazine is available only to AHS members, and as well as its print edition it now comes in an impressive online edition. Membership of the AHS is incredibly good value for only $35 a year. It’s worth that for The American Gardener alone and there are many many of other benefits. Join now and check out my piece on Planting in Dry Shade in the latest issue. • And don’t forget the book has its own websites: DryShadeGarden.co.uk for British and Irish readers, and DryShadeGarden.com for North American readers. Today’s entertainment is the WJFF Fund Drive Garden Special. Adrianne Picciano (the Dirt Diva) and I are hosting a two hour fund raising garden special on our local public radio station, WJFF serving the Catskills of New York State, North East Pennsylvania and the Upper Delaware River Valley. You can hear it locally on 90.5FM, 3.00-5.00pm EST and streaming live online across the country and around the world at WJFFRadio.org. WJFF is the only hyrdo-powered radio station in the country! Along with out guests Master Gardener and local newspaper columnist Will Conway, Permaculture Expert Maria Grimaldi of Panther Rock Farms and orchid expert judywhite we’ll be answering emailed questions from listeners, taking pledges to help support WJFF – and giving away lots of garden goodies as “thank you gifts”. This is, of course, a local event but here I’d just like to thank the various gardening companies and organisations who are supporting independent public radio – and good information about gardening – by donating “thank you gifts” to the station. I's a fine testament to these businesses and individuals that they're happy to make donations to a good cause in these difficult times. Thank you. * Permaculture Design Certificate course (one place) hosted by Andrew Phillips of the Hancock Permaculture Center and Maria Grimaldi of Panther Rock Farms. * Garden notecards donated by Echo Letterpress (see samples above) in Jeffersonville NY. Beautiful woodcut-style designs of garden tools, herbs, and Japanese pruners. * Bloom Again Orchids Signed copies of a colorful new book on easy orchids that bloom again and again donated by local judywhite. * Green Up Time CD Locally based horticulturalist and Broadway performer Ellen Zachos combines her two passions in life with songs about plants. 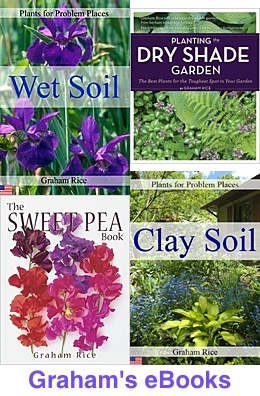 * Annuals and Perennials Book Bundle The Readers Digest Complete Guide to Perennials, Gardeners Guide to Growing Hellebores, Discovering Annuals, and Handbook of Annuals and Bedding Plants. All by Graham Rice, all signed by the author. * $50 Gift Certificates to White Flower Farm, the country’s leading supplier of mail order perennials and shrubs. * One year membership to the American Horticultural Society. Thank you to all these supporters – and to our listeners who provide over half the funds required to run the station. It’s going to be a fun afternoon. AFTER THE SHOW UPDATE We had a great show, answered lots of questions, raised a good amount for WJFF, and gave plenty of thank-you gifts away - in spite of the distraction of the first snowstorm of winter. Thanks to all our listeners and supporters.